Microsoft seems to be moving quicker than anybody expected. Since they ditched Nokia in order to release phones under their own brand, they already have a phone on the market and a few more in the works, like the Lumia 1030, rumored to be the first flagship released under the new branding. According to a Chinese website, cited by Nokia Power User, another smartphone should be unveiled soon. We’re talking about the Microsoft Lumia 435, another entry-level device ready to complete the Redmond-based manufacturer’s portfolio. As you can see, it will be a compact device, so considering the fact that it was already tested in India, it won’t be an expensive smartphone. The previous model, Lumia 535, was another entry-level phone, so we’re guessing that Microsoft still wants to test the market before releasing an actual flagship. 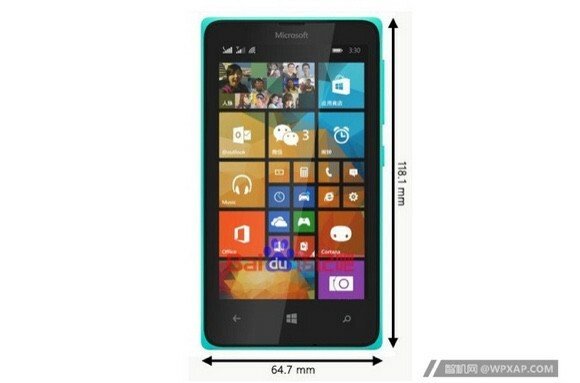 Apparently, the Microsoft Lumia 435 will feature a 4″ VWGA display, with a resolution of 400 x 800 pixels and a density of 235 ppi, while under the hood we’re going to find a Snapdragon 200 chipset. No other details about the internals are available at the moment. Other known features worth mentioning are the 5 MP camera and the dual-SIM support. Waht do you think about this device? Would you buy a Microsoft Lumia 435?